Magnetic clamping force - 10,000N Wattage - 1120W Rotation speeds - 450rpm Height - 182mm Lift -..
Watts = 1050 Travel = 150mm Capacity = 35mm Magnetic = 12000n Adhesion Weight = 12 Kg.. Magnetic clamping force - 10,000N Wattage - 1120W Rotation speeds - 450rpm Height - 413-548mm Li.. Magnetic clamping force - 13,000N Wattage - 1200W Rotation speeds 1st gear - 100-250rpm 2nd gear .. 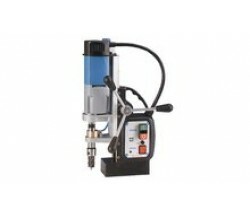 Magnetic clamping force - 13,000N Wattage - 1840W Rotation speeds 1st gear - 100-250rpm 2nd gear ..